I love these types of projects. 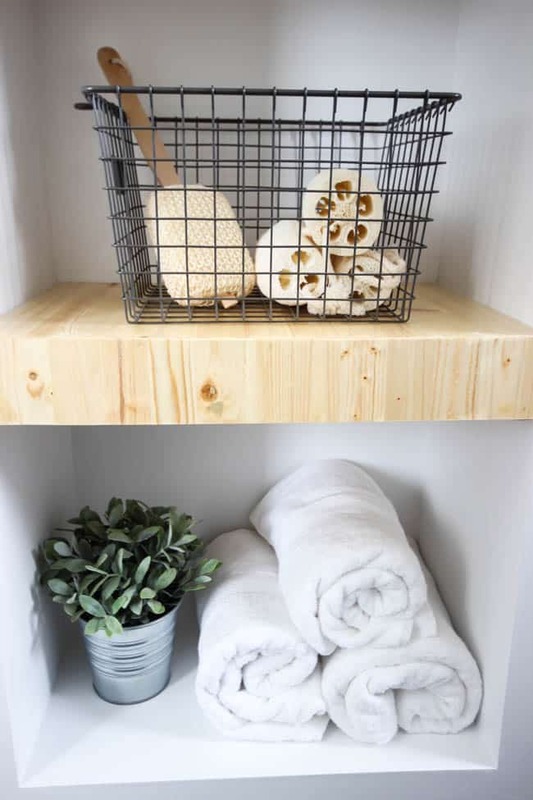 DIY Projects that you can easily modify and recreate for any space or room. 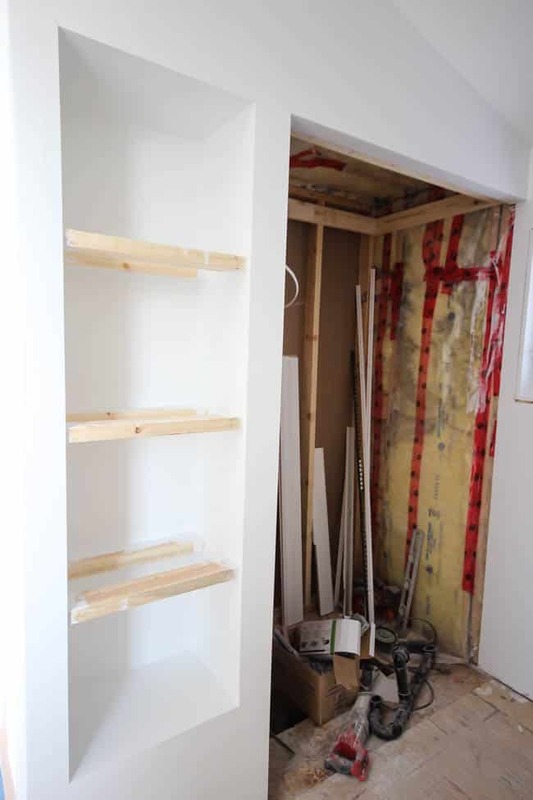 When we removed the closet doorway here, I knew we wanted to use this space for built-in shelving. 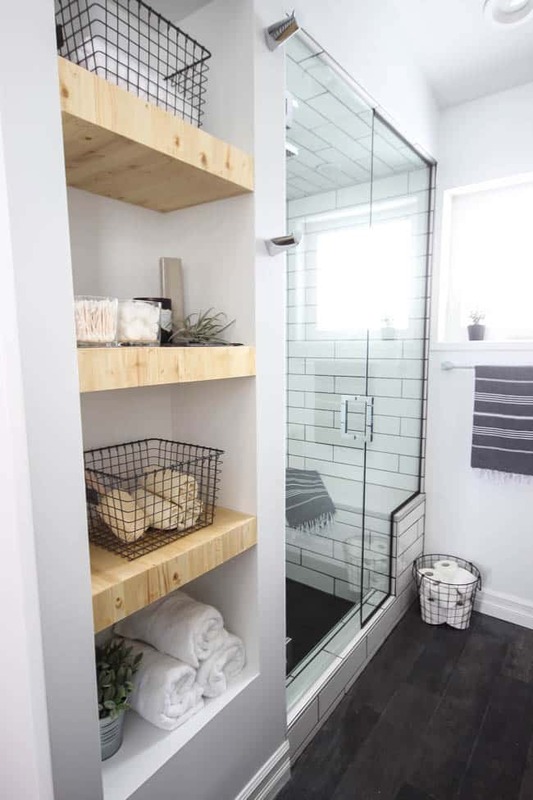 Built-in shelving is the best way to use those “wasted spaces”, like corners, hallways, and walls. 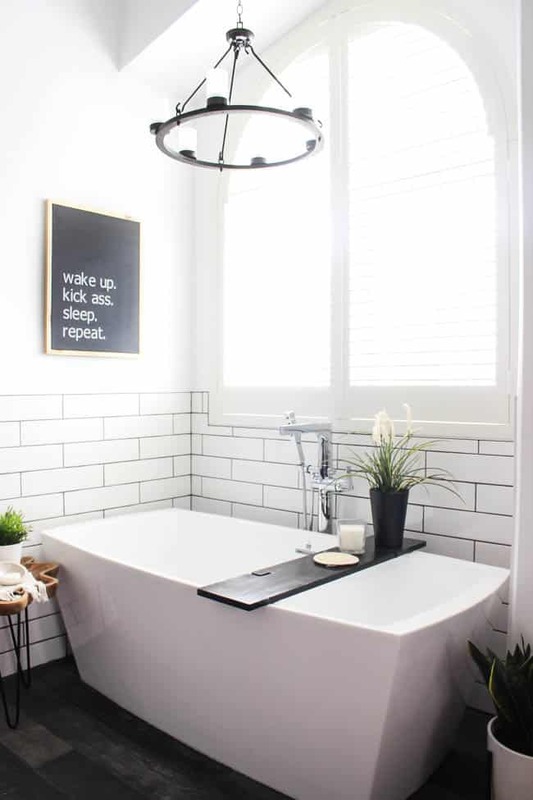 This turned out to be one of my favourite projects of this modern bathroom! This is the before picture. There used to be a doorway in that spot, but we took out the doorway and added a barn door on the other side instead. Then we were left with an open space, which was perfect for built-in shelving! 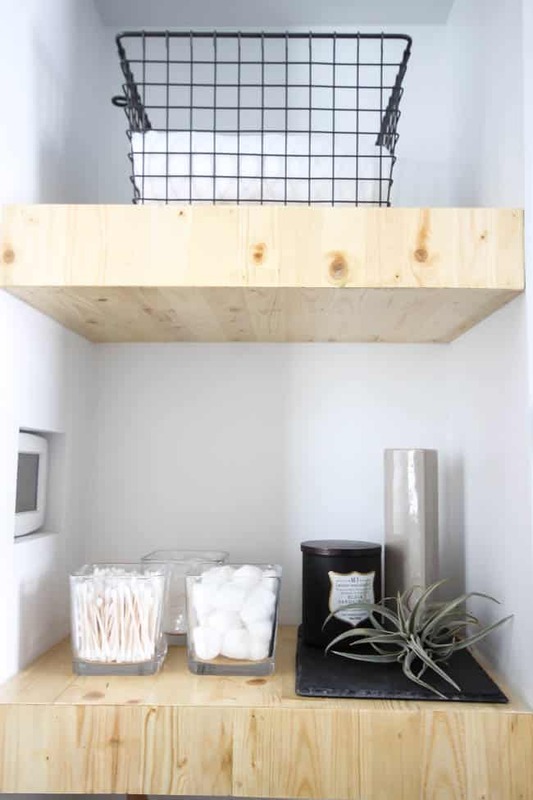 How to Make Your Own Built-In Shelving? 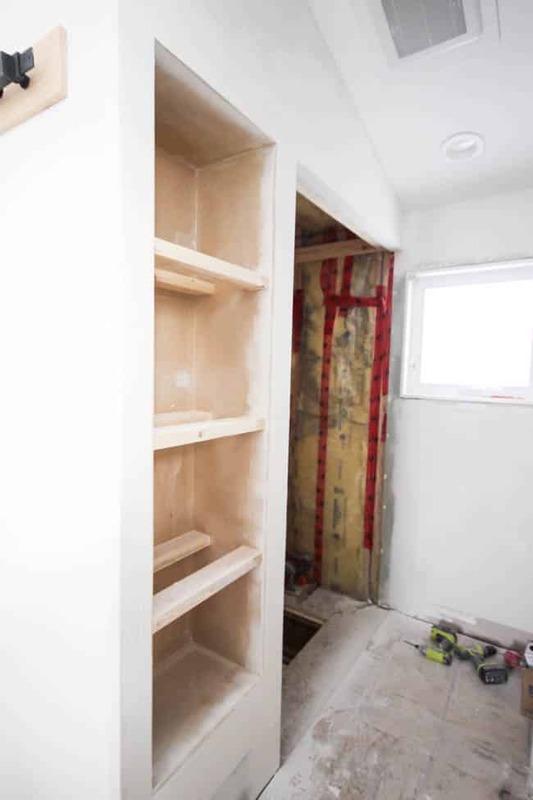 Start by measuring your opening to determine your outside dimensions (confirm outside width, height, and depth) of your built-ins. (i.e. measure the box you are filling up with shelving). We had framed our box with 2x4s before starting our shelving project. 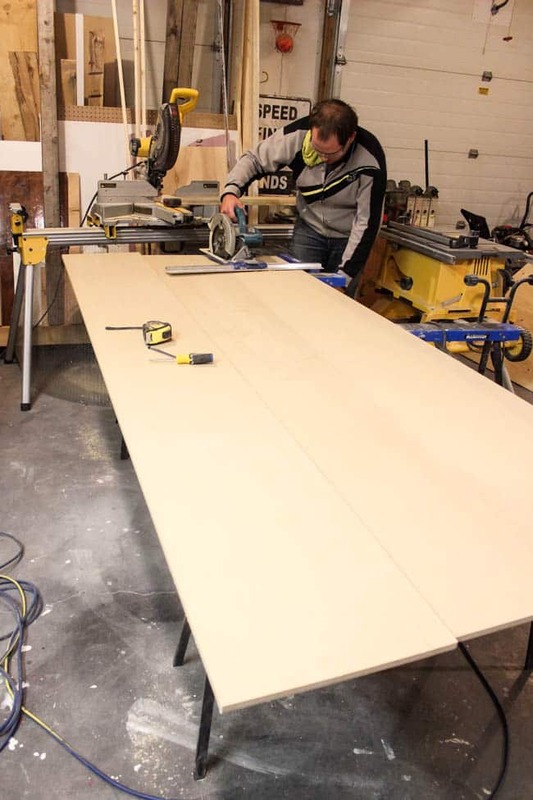 Next, cut your pieces for the box using MDF (back portion, 2 sides, a top and a bottom board). We used a rip-cut to easily make the straight cuts. 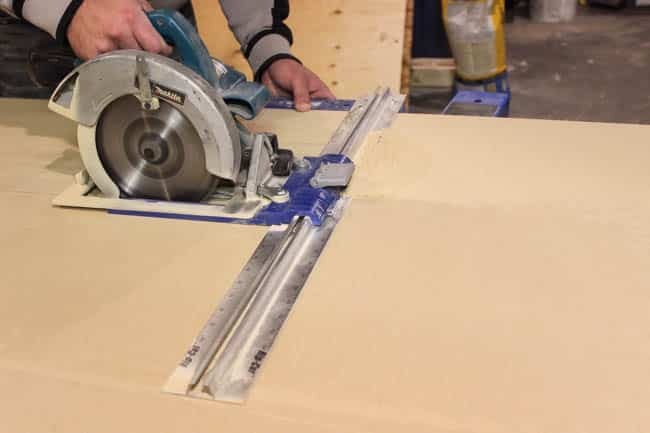 Remember to take in consideration the thickness of the material you are using when you cut your sides and back piece). Construct your MDF box. Dry fit the four sides and back all together. We used clamps to temporarily hold all the pieces together. 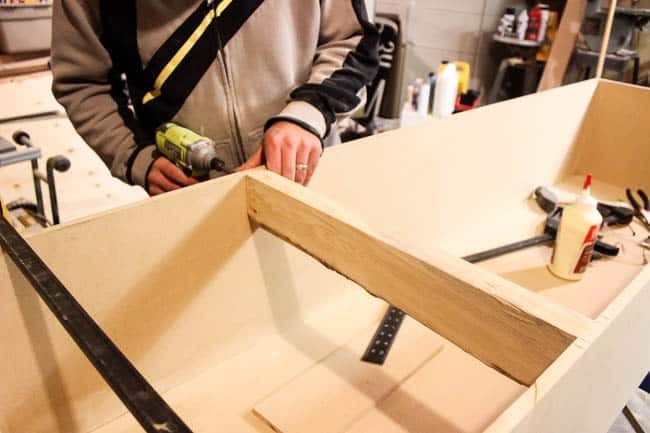 Before assembling, we pre-drilled the holes (pilot hole and counter sunk bit) at all the joints, we did 3 holes per joint. When ready, remove the clamps, glue the edges and screw the box back together. Layout your shelfs inside the box. We divided the box into 4 equal spaces. Put 2x4s at the front and back of the box where you want the shelved to sit. This will be used to attach your shelves. 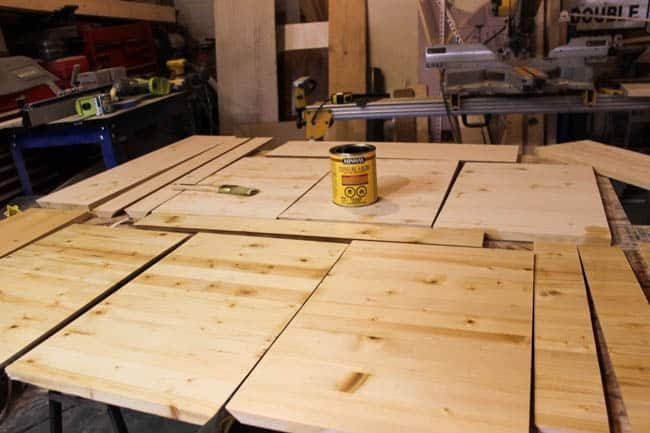 Once you have cut your 2x4s, glue and screw into place. 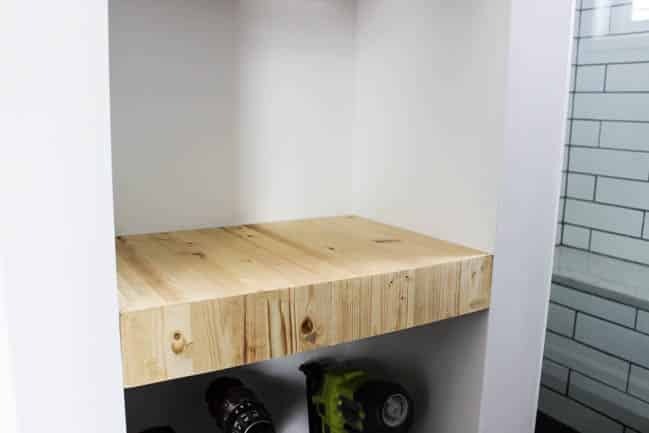 Below is that the shelf will look like with the 2x4s in place at the front and back. You can see there is a small space left at the front. That space is the width of our pine shelf board so that the shelves will be flush with the wall. 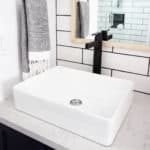 Bring your entire MDF box up to your space and put it in place. 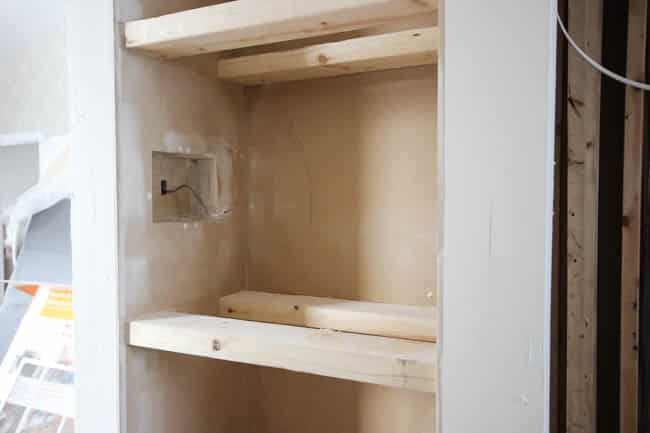 You can install trim to finish the box (around edge of box and onto drywall), or you can tape and use drywall putty to blend into drywall to achieve a smooth flush transition (this is what we did). If choosing to try and tape into drywall, we routered/grooved the outside edge of the MDF slightly (about 1/8″) to allow room for the drywall tape and mud. 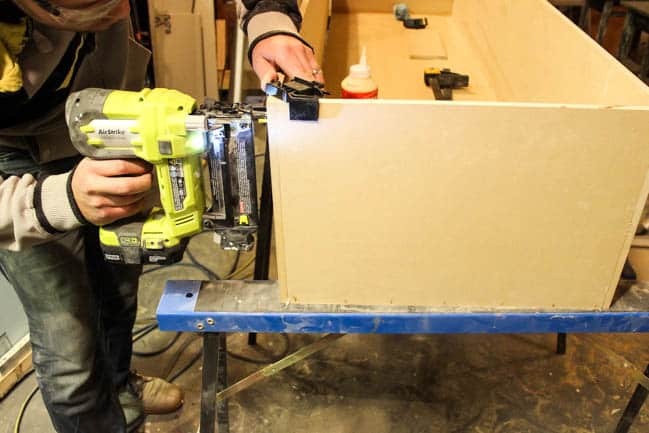 Putty any screw holes, sand, prime, and paint the MDF case. Install the MDF box in place. Level and screw to structure. 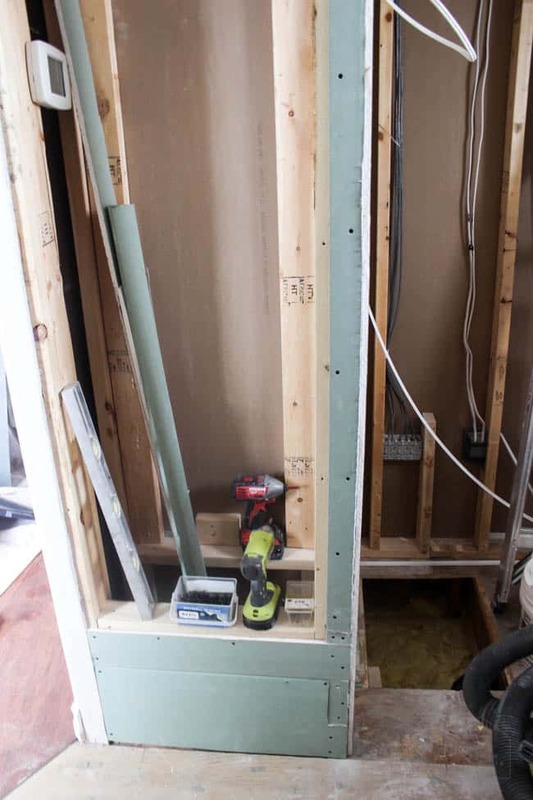 Ensure that it’s screwed into the studs and watch out for utilities in the walls (electrical, plumbing, etc). Putty and touch up finish as required. Measure the inside dimensions of your box at the shelf locations. 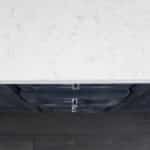 Each shelf will require 3 pieces, a top, front, and bottom. 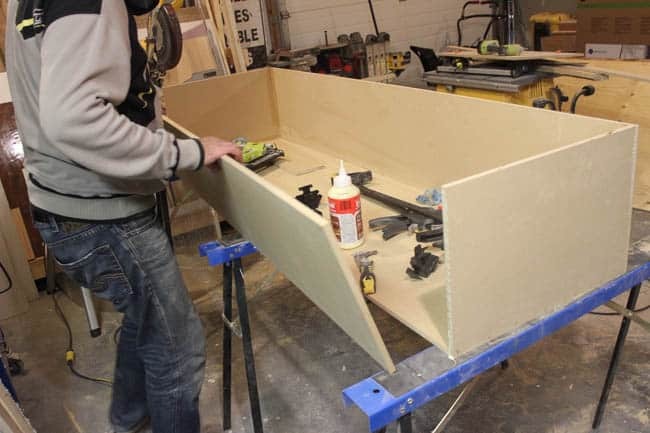 The front board will have a 45 degree cut on the top and bottom, the bottom and top boards will have a 45 degree on the side facing the front board. 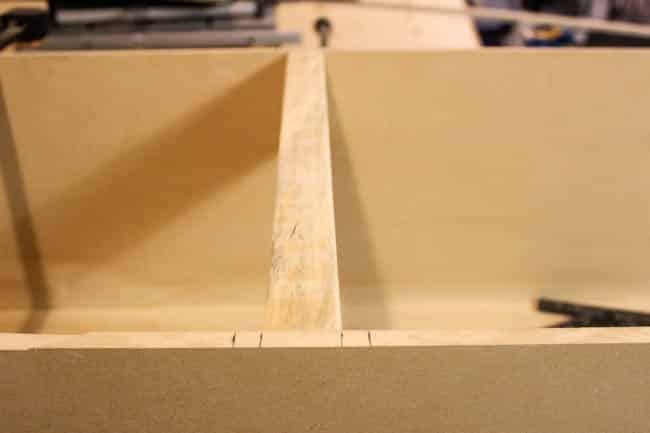 When cutting and measuring the front board remember to take in account the thickness of the shelf material. You can see the top board below (under the polycrylic) with one straight edge and one 45 deg edge. 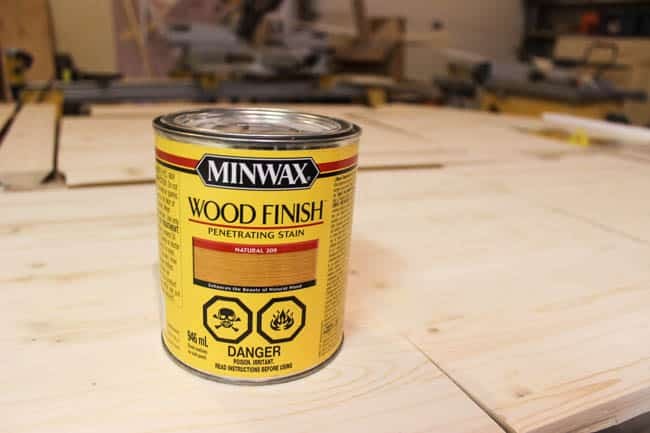 If using wood, stain and varnish the shelves prior to installing in the MDF case. 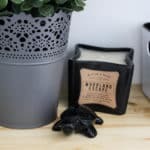 If using MDF shelves, prime and paint. I used my Natural Wood Stain from Minwax. 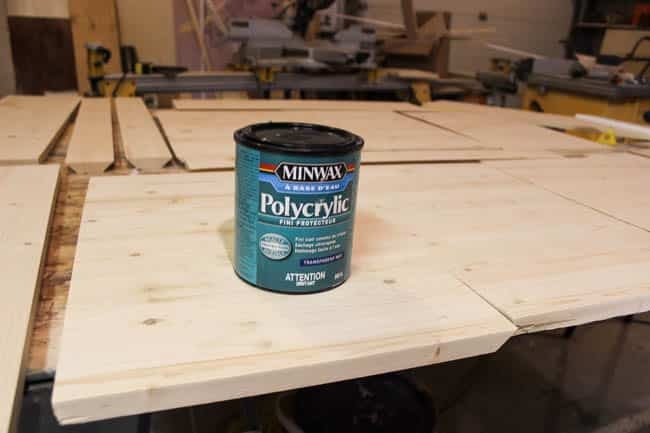 When that was dry I protected everything with Polycrylic. Attach the shelves to the 2x4s in the MDF case. We used glue and finish nails. 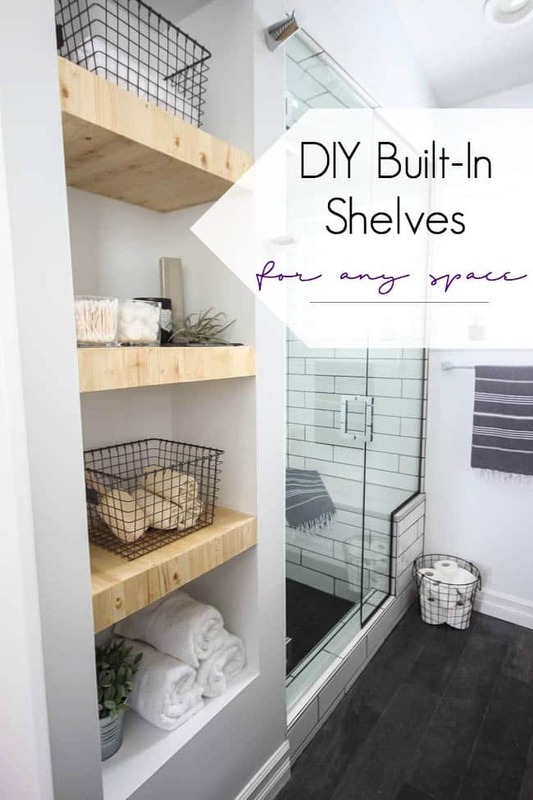 Now enjoy your new built-in shelving! 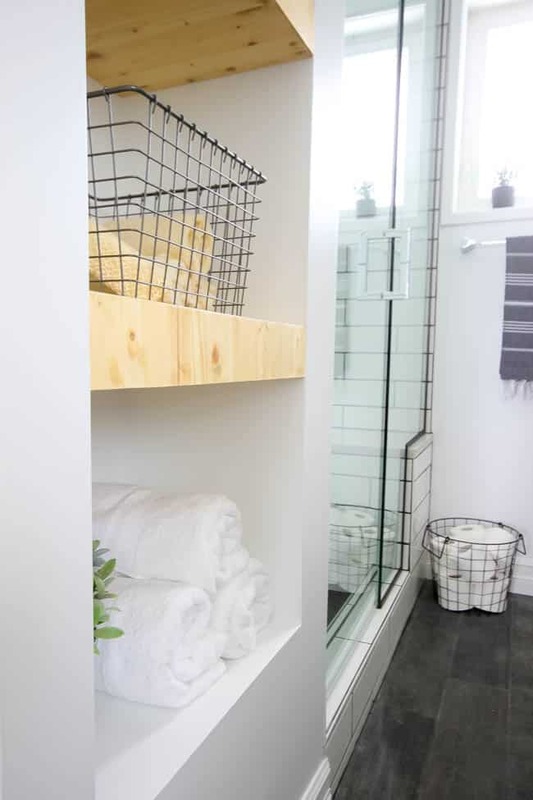 I LOVE the look of these shelves in our renovated ensuite! 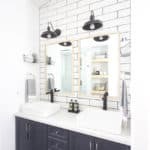 See the full, beautiful Modern Bathroom Renovation! Great job! Thanks for sharing… it’s really useful for us. What a great job! I love the result so much!! Thank you for sharing! Im in love with the result. The shelves will help maintain the order of the house. Whatever you place there will be neatly piled up. 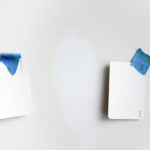 Thank you for sharing your idea and instructions.Id love to read more of DIY projects from you. 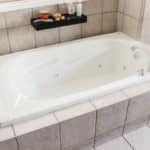 We did this in a really small bathroom that also had access thru a hallway (we closed off a doorway into a bed room) The new cabinet is just deep enough (so we did not steal room from the bed room or the teeny bath room) to hold a roll of toilet paper or paper towels with 6 shelves. 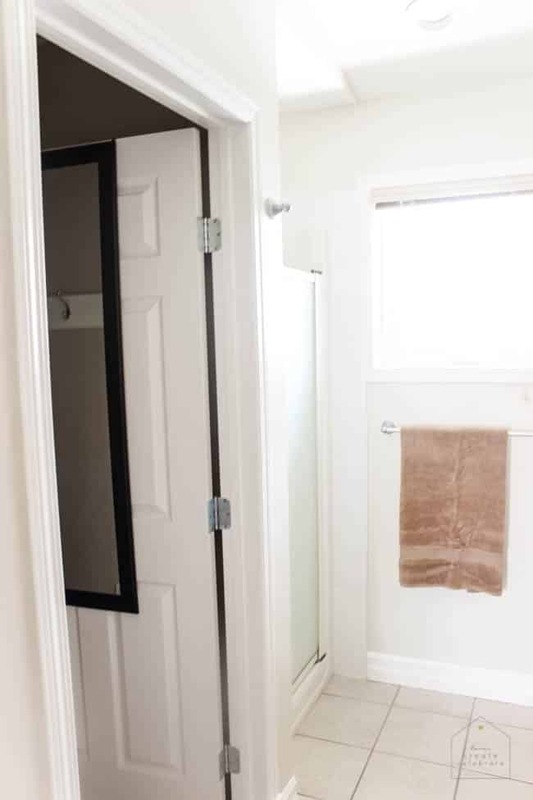 Since the new cabinet sits directly across from the toilet (and there is just enough room to walk between the cabinet and the toilet) My husband made a “tip out” door and mounted the toilet paper holder on the inside… there is also enough room for a magazine bin down there too. 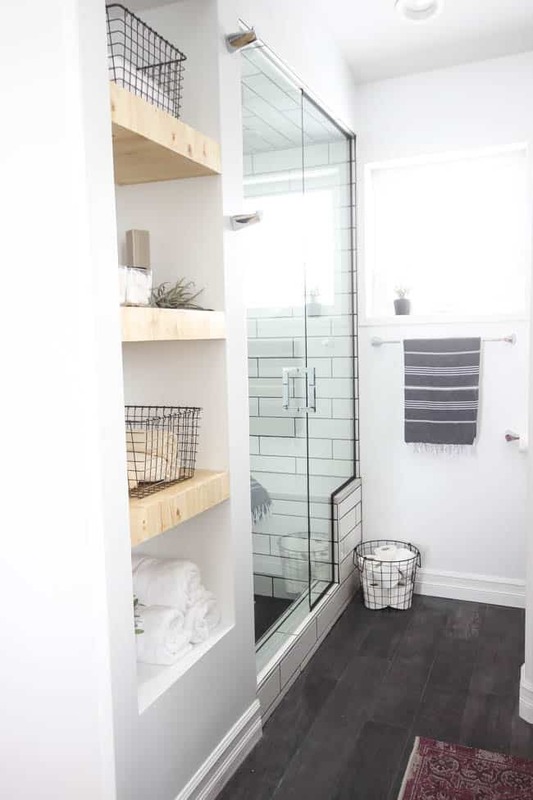 Such a great use of space!! Love what you did! Lindi, this is fantastic. About how long did this project take you? Were you able to do this in one day? Anyway, I’m impressed. You obviously have an inner general contractor. Keep it up. I would love to see more posts like this. This is awesome. I want to do this!